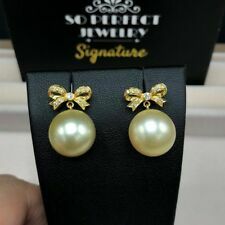 Genuine 18K Yellow Gold Tahitian South Sea Cultured Pearl Stud Earrings. Type: Tahitian South Sea Cultured Pearl. 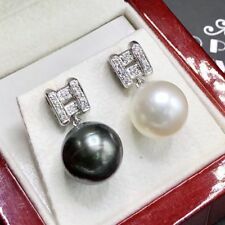 Commonly known as black pearls around the world, the pearls in Tahiti are indigenous to the remote lagoons of French Polynesia in the South Pacific where the black -lipped oyster is found, a mollusk that secretes a black nacreous substance. ANGEL SKIN CORAL ROSE AND 10 X 7 MM NEON SOFT. CHAMPAGNE CULTURED TEAR DROP PEARL EARRINGS JACKETS. CREATE COOL LOOKS WITH THE JACKETS. GORGEOUS EARRINGS. THESE JACKETS ADDS BEAUTY TO ANY STUDS TOO. 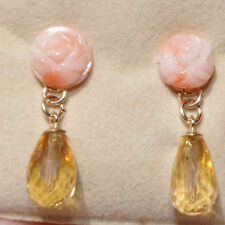 ANGEL SKIN CORAL ROSE AND 10 X 7 MM GOLDEN CITRINE TEAR DROP EARRINGS JACKETS. USE CITRINE JACKETS WITH ANY OTHER STUDS YOU PREVIOUSLY OWN. CREATE COOL LOOKS WITH THE JACKETS. GORGEOUS EARRINGS. THESE JACKETS ADDS BEAUTY TO ANY STUDS TOO. Style : Earrings. Colors may appear different on each computer monitor. Most issues can be resolved with simple communication. Condition: New, No Box. ANGEL SKIN CORAL ROUND STUDS AND. 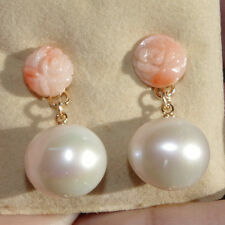 10 X 7 MM NEON SOFT GOLDEN CULTURED TEAR DROP PEARL EARRINGS JACKETS. LAST PHOTOS SHOWS HOW TO USE THE PEARL JACKETS WITH OTHER STUDS. THESE JACKETS ADDS BEAUTY TO ANY STUDS TOO. We are presenting you A PAIR OF matching SOUTH SEA PEARLS with LUSTROUS WHITE color. SET IN HANDCRAFTED, 18K SOLID YELLOW GOLD DROP EARRINGS. Accented with 48 pieces or superb quality, F/VS sparkling diamonds. Grade: AA clean frontal surface. We are presenting you A PAIR OF matching SOUTH SEA PEARLS with LUSTROUS WHITE color. SET IN HANDCRAFTED, 18K SOLID GOLD DROP EARRINGS. Naturally Cultured South Sea Pearls. Style : Earrings. Most issues can be resolved with simple communication. Colors may appear different on each computer monitor. Condition: New, No Box. Topos, Pendientes o aretes en oro solido real 18k para niña, chica y mujer y con perla natural 5mm. I wanted 18 karats solid gold. That was the beginning. Reduce allergy : no nickel, no gold filled, no gold plated. 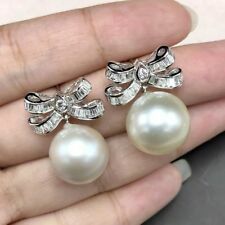 AND 10 X 7 MM NEON SOFT GRAY / PEACOCK CULTURED TEAR DROP PEARL EARRINGS JACKETS. ANGEL SKIN CORAL ROSE. CREATE COOL LOOKS WITH THE JACKETS. GORGEOUS EARRINGS. 7 MM ANGEL SKIN CORAL ROSE AND. CULTURED TEAR DROP PEARL EARRINGS JACKETS. CREATE COOL LOOKS WITH THE JACKETS. GORGEOUS EARRINGS. THESE JACKETS ADDS BEAUTY TO ANY STUDS TOO. This piece is very unique ,gorgeous and practical to wear. We are presenting you A PERFECT PAIR OF CREAMY WHITE SOUTH SEA PEARLS! WITH EXCELLENT LUSTER. Accented with 22 pieces or superb quality, F/VS sparkling diamonds. SET IN HANDCRAFTED, 18K SOLID YELLOW GOLD SCREWED BACK EARRINGS. Type Akoya cultured pearl Luster High. Diamond Number Diamond weight. Color Natural white Surface Smooth. Shape Round Uniformity Very good. EARRINGS: 7.0 grams of handcrafted 18K solid white gold earrings. ONE OF A KIND! HANDMADE BY PROFESSIONAL GOLDSMITHS! Accented with 48 pieces or superb quality, F/VS sparkling diamonds. SET IN HANDCRAFTED, 18K SOLID WHITE GOLD PUSH BACK EARRINGS. Item Type: Necklace. Condition: New. 58 natural, untreated diamonds weighting a total of 0.57 carat. We are presenting you A PERFECT PAIR OF matching LUSTROUS WHITE SOUTH SEA PEARL AND SHINY BLACK TAHITI PEARL with EXCELLENT, TOP LUSTER. DIAMONDS: 20 natural, untreated diamonds weighting a total of 0.16 carat. ANGEL SKIN CORAL ROSE AND. 10 X 7 MM NEON SOFT ROYAL BLUE CULTURED TEAR DROP PEARL EARRINGS JACKETS. CREATE COOL LOOKS WITH THE JACKETS. GORGEOUS EARRINGS. THESE JACKETS ADDS BEAUTY TO ANY STUDS TOO. 7.0 grams of handcrafted 18K solid white gold earrings. CREATE COOL LOOKS WITH THE JACKETS. AVERAGE SIZE : 10 X 7 MM CULTURED GOLDEN PEARLS. THESE JACKETS ADDS BEAUTY TO ANY STUDS TOO. GORGEOUS EARRINGS. THESE CAN BE USED AS CHARM. I HAVE SEVERAL PAIRS & EVERY PAIR IS DIFFERENT. AND 12 X 10 MM NEON SOFT GOLDEN CULTURED TEAR DROP PEARL EARRINGS. 7 MM PEARL STUDS. 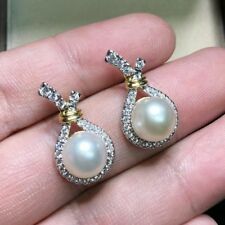 SIZE : 12 X 10 MM CULTURED GOLDEN PEARL DANGLES. 7 MM STUDS. ANGEL SKIN CORAL ROSE AND 10 X 7 MM. NEON SOFT GOLDEN CULTURED TEAR DROP PEARL EARRINGS JACKETS. CREATE COOL LOOKS WITH THE JACKETS. GORGEOUS EARRINGS. THESE JACKETS ADDS BEAUTY TO ANY STUDS TOO. 10 X 7 MM CULTURED GOLDEN PEARLS. Ruby Gemstone Wt :- 6.55 Ct. Pearl Gemstone Wt :- 21.69 Ct. 14k Yellow Gold Wt :- 0.28 gm. 925 Sterling Silver Wt :- 7.08 gm. Diamond Wt :- 1.35 Ct.
Accented with 32 pieces or superb quality, F/VS sparkling diamonds. SET IN HANDCRAFTED, 18K SOLID WHITE GOLD SCREWED BACK EARRINGS. EARRINGS: 6.5 grams of handcrafted 18K solid white gold earrings. 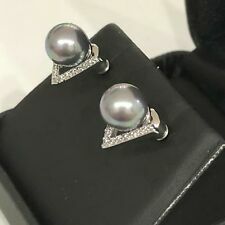 Genuine 18K White Gold Tahitian South Sea Cultured Pearl Stud Earrings. Type: Tahitian South Sea Cultured Pearl. Commonly known as black pearls around the world, the pearls in Tahiti are indigenous to the remote lagoons of French Polynesia in the South Pacific where the black -lipped oyster is found, a mollusk that secretes a black nacreous substance. We are presenting you A PERFECT PAIR OF MISS-MATCHING TAHITI AND WHITE SOUTH SEA PEARLS! WITH EXCELLENT LUSTER. Accented with 30 pieces or superb quality, F/VS sparkling diamonds. SET IN HANDCRAFTED, 18K SOLID WHITE GOLD SCREWED BACK EARRINGS. DIAMONDS: 20 natural, untreated diamonds weighting a total of 0.18 carat. ALL DIAMONDS F COLOR ALL DIAMONDS ARE VS QUALITY. Accented with 20 pieces or superb quality, F/VS sparkling diamonds. SET IN HANDCRAFTED, 18K SOLID WHITE GOLD SCREWED BACK EARRINGS. Accented with 74 pieces or superb quality, F/VS sparkling diamonds. SET IN HANDCRAFTED, 18K SOLID WHITE GOLD DANGLING EARRINGS. BEAUTIFULLY DESIGNED! Perfect combination of elegance and simplicity. Accenting the 2 pearls are 30 pieces of E/VS Natural diamonds, weighting a total of 0.30 carat. Set in fabulously designed 18K solid yellow gold, FLORAL earrings. HUGE PAIR! These pearl earrings are so sparkling! Diamonds Studs Gold diamond Rings Gold Diamond pendant Diamond Necklace. This Studs available in all three Gold (Rose / Yellow / White). Birthstone Studs Solid Gold Jewelry Carving Earrings Beads & Findings.